There are certain events in our lives that leave indelible memories. Two of them stand out in my life. I can remember the details as if they happened yesterday. They are like a dream in color etched in my brain and they make me smile every time I think of them. No, they weren’t my first kiss or first homerun, I remember those events too but, many of those details are fuzzy or forgotten. No, this is way bigger than that…. who could forget their first steelhead? I was 12 years old sitting next to a small fire on the Duwamish River with my dad when it happened. The year was 1958. I turned and saw my rod bucking violently in the make shift rod holder. A 13 pound female jumped 3 feet out of the water and my life changed forever. The second event happened 6 years later on the North Fork of the Stillaguamish. On my 4th cast with a flyrod, a 12 pound buck crushed my Umpqua Special and I joined the fraternity of fly fisherman on that “storied” river. This was the beginning of a lifelong passion and pursuit of these special fish. In a typical season I would spend more than 100 days chasing these critters. Even as a teenager, I had many fisherman say to me “You should be a guide”. After graduating from the “U dub” in 1970, my father and I had a long talk about careers and life. He encouraged me to follow my passion and helped me buy my first jet sled. In those days the Cowlitz was the “show” and I became a very successful guide there. At the end of Jaunary I moved my operation to the Upper Quinalt, Queets, and Humptulips . Not realizing at the time that steelhead could be effectively pursued with a fly rod year around, I saved my fly fishing for the summers. As a school teacher, I had lots of time to learn how to present the fly properly, how to tie flies and how to make lines as the commercial fly lines back in those days weren’t very good. I worked on my game and I got good at it. I was fortunate to have the time and resources to fish all over Alaska and British Columbia. My first trip to the Kispiox was 1969 and to the Kenai in 1977. I guess I could say “Done that” to just about everyone, except to one guy. His name was Bob York. Bob was my friend (I put his ashes in the Skagit, Grande Ronde, and Kispiox rivers). He fished in more watersheds, spent more time camping on wilderness rivers traveling the British Columbia and Alaskan coasts for months at a time then any man alive. Bob caught 8 steelhead over 30 lbs. He was the one that convinced me to fly fish year around and give away my conventional tackle. That was almost 25 years ago. Now fly fishing 12 months a year with increased vigor I joined the “circuit”. Most fly fisherman who fish a lot wind up going to the same places at the same time year after year. You make friends and look forward to their arrival. The word travels up and down the river like the wind. “Harry’s here!” or “DV ‘s broke down in Lewiston”. During my Grande Ronde days, I became friends with Jimmy Green and many fine folks from Spokane, Idaho and Oregon. It was this group of guys who got me into Spey and distance casting. With their help I entered into 5 Jim Greene Casting Tournaments eventually coming in third place one year. We were experimenting with lines and developed Skagit- style spey lines several years before Rio began marketing and selling them. One of the rivers I had not fished was the Methow. Bob Allen, a friend of mine convinced me that I had to try this river. We went there on opening day of deer season. We walked into the “Red House” hole and each caught a fish. At lunch time we went to Twisp , saw a buck deer in the back of a pick-up and couldn’t help but notice the friendly atmosphere. It had been a cold morning but, the afternoon sun was warm ( a typical fall day in the Methow Valley). I said to Bob: “I could live here”. Well , now I do. The Methow has been my “home river” for more than 5 years now. I fish it almost daily during the steelhead season.. I began guiding there 3 years ago primarily for fly fisherman. I love this watershed. The steelhead are 5-15 lbs…cutthroats, cuttbows, and rainbows are large, sometimes exceeding 25 inches…bull trout have been landed that are more than 10 lbs ….and the river has the biggest whitefish I have ever seen. It is an incredible, diverse eco system and the fish love the fly! At 65 years young I bring a lifetime of knowledge and experience to the table. I am a natural teacher and thoroughly enjoy guiding for steelhead and teaching spey casting. 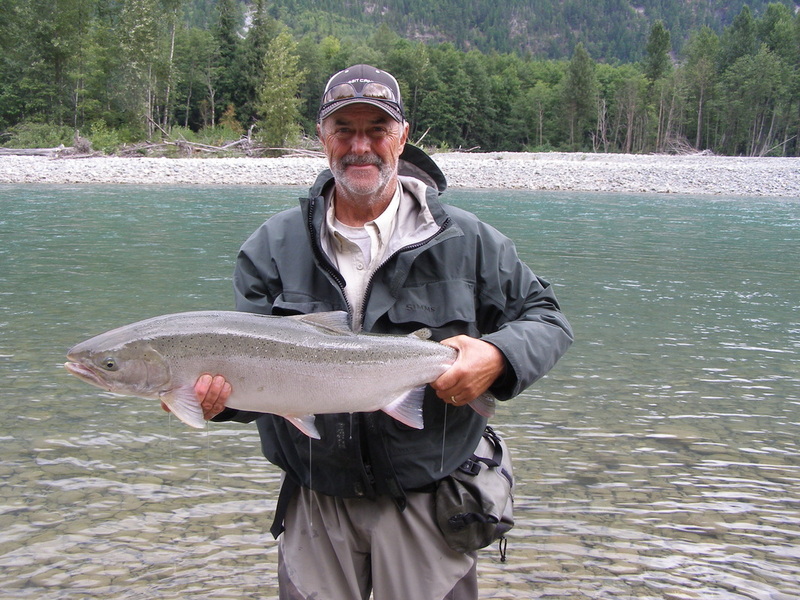 I know how to catch steelhead and make it a priority to give you a first rate experience. If conditions are not right (for example, the water is too cold) I will tell you and let you decide whether to come or cancel….you get 100% honesty 100% of the time. We fish from a 14’ raft especially designed for guiding and occasionally will walk into a particular spot. This is determined by conditions and customer preference. I loved my friend Bob York and would visit him once a week for a cup of coffee when he wasn’t fishing. We’d talk for hours about the old days, different rivers, and how things have changed. He was a wealth of information. I can be that for you too…..